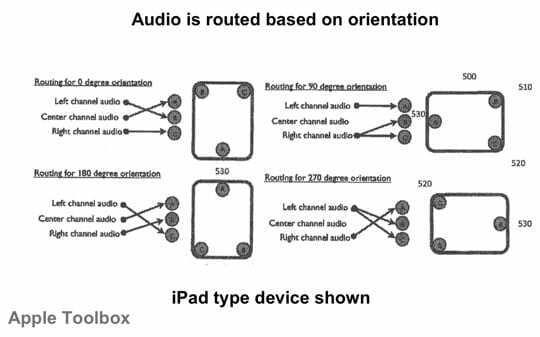 Today the U.S. Patent and Trademark Office (USPTO) published a patent application from Apple that describes a method of automatically routing audio to different speakers on an electronic device, based upon its orientation. 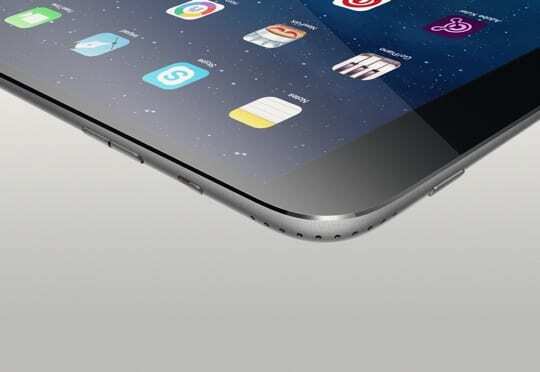 This may be used in the long-rumoured iPad Pro which is said to include additional speakers on the sides of the device. The patent, entitled “ORIENTATION-BASED AUDIO” describes a method for outputting audio based on an orientation of an electronic device, or video shown by the device. The audio may be mapped to a set of speakers using either or both of the device and video orientation to determine which speakers receive certain audio channels. 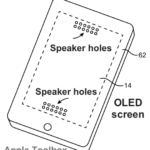 This appears to back up recent rumours that an iPad Pro with multiple speaker orientations may be on the cards in 2015. The rise of portable electronic devices has provided unprecedented access to information and entertainment. 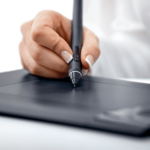 Many people use portable computing devices, such as smart phones, tablet computing devices, portable content players, and the like to store and play back both audio and audiovisual content. For example, it is common to digitally store and play music, movies, home recordings and the like. Audio is routed to the speakers based on device orientation. Many modern portable electronic devices may be turned by a user to re-orient information displayed on a screen of the device. As one example, some people prefer to read documents in a portrait mode while others prefer to read documents shown in a landscape format. And many users will turn an electronic device on its side while watching widescreen video to increase the effective display size of the video. Many current electronic devices, even when re-oriented in this fashion, continue to output audio as if the device is in a default orientation. That is, left channel audio may be omitted from the same speakers regardless of whether or not the device is turned or otherwise re-oriented; the same is true for right channel audio and other audio channels. 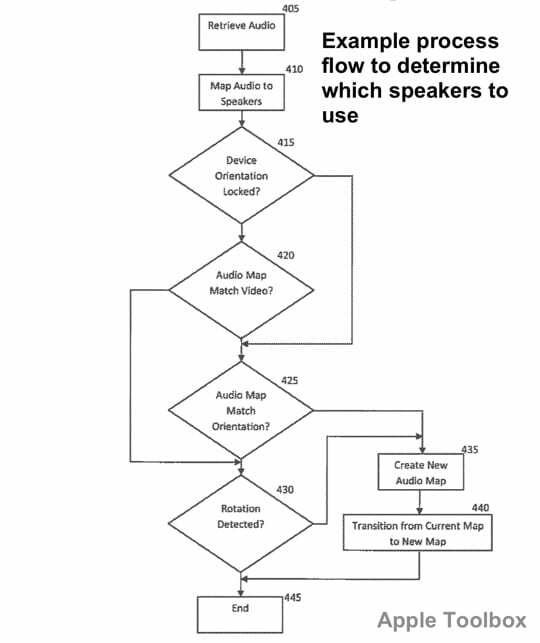 The patent describes methods for routing audio dynamically. Apple’s invention could drastically enhance the audio experience, especially when playing games. 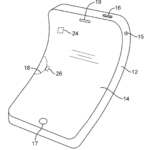 It remains to be seen whether the patent will make it into an of the company’s products. 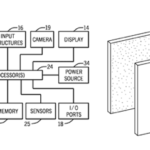 The patent seems particularly relevant to the much-rumoured iPad Pro. That device is supposed to have additional speakers that function in multiple orientations. 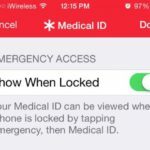 It seems like the patent is intended to be used in just such as device. 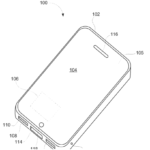 Apple credits Martin E. Johnson (Los Gatos, CA), Ruchi Goel (San Jose, CA) and Darby E. Hadley (Los Gatos, CA) as the inventors of U.S. patent application number 20150023533. 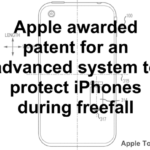 Apple applies for and is granted many patents every week. Some of the most interesting recently include a patent for display-based speakers and another for flexible electronic devices.